Mango custard recipe I have shared here can be easily made with mango and vanilla custard powder. 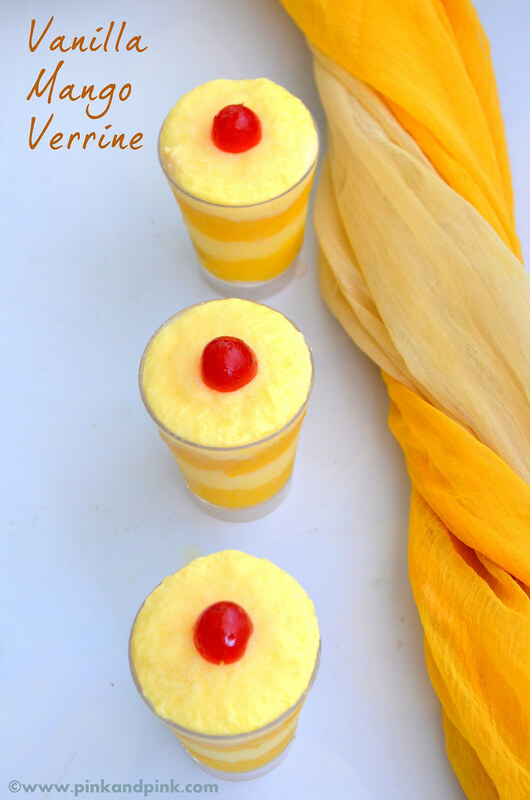 This is my first verrine recipe in this blog. Wondering what is verrine? According to wiki, Verrine is a small thick glass container with no base, which purpose is to contain a solid or liquid dish(starter, course or dessert), rather than a drink. I have used fresh mango and vanilla custard powder with milk to make this layered dessert. 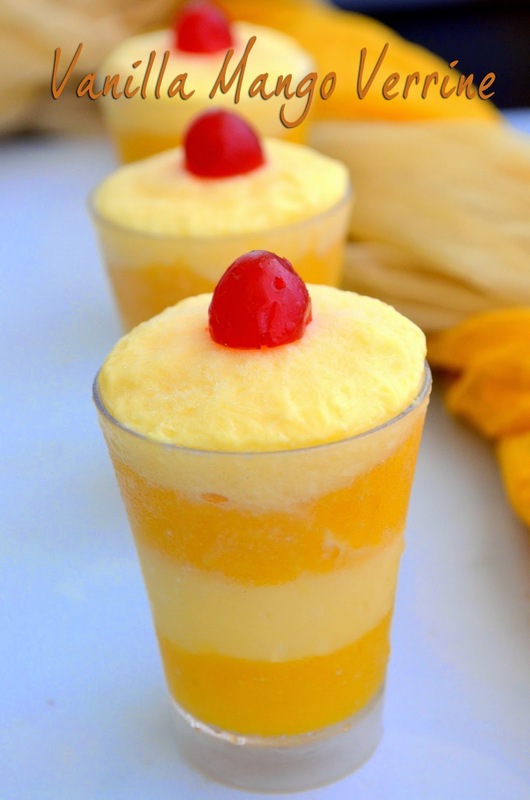 This mango custard recipe is definitely an easy mango dessert recipe to be tried. 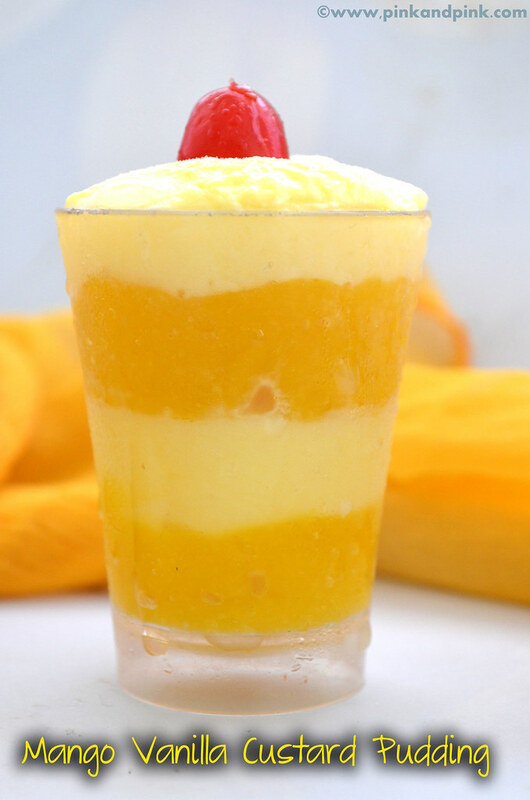 I am sure your children will be very happy when you have this mango vanilla custard verrine ready for them once they come back after playing in this hot vacation. 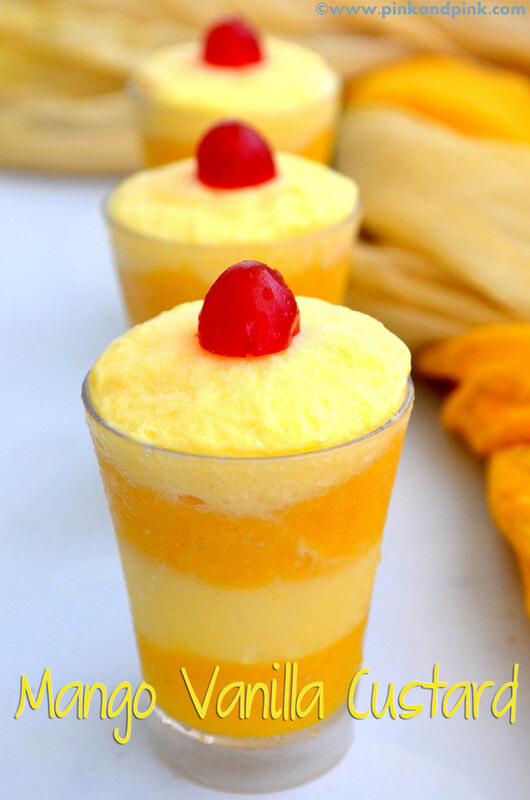 As this is mango season, use it to make this yummy dessert. Recently I made choco vanilla layered pudding for my guests. You can expect the recipe soon in this blog. Before you prepare this mango vanilla custard verrine, you need to decide how many layers you are going to create and what is the order you are going to have. Is the order going to be mango then vanilla then mango or vanilla, mango and vanilla? I would suggest having the vanilla layer at the top of the glass since it looks great and it makes garnishing easy. Cherries and other garnishing items look great with vanilla layer. 1. Peel off the skin from the mango and take the flesh. Discard the seed. Grind it in a mixie and make a smooth paste. If the mango is not sweet, add required sugar while grinding. Place the mango pulp in the bottom of the verrine glasses. Refrigerate them till we get ready with the vanilla layer. Refrigerate the remaining pulp too for later use. 2. Take 1/4 cup boiled milk in a bowl. Add the custard powder(or vanilla essence and corn flour) and sugar to the bowl. Mix well and make sure that there are no lumps. Heat the remaining 3/4 cup milk. Add the milk and custard mixture to the boiling milk. Mix well till the mixture gets thickened. Do it in low flame and ensure that there are no lumps formed. Stir it continuously. Once the mixture is thickened, switch off the flame and allow it to cool. 3. Take out the refrigerated verrine glasses and pour the custard mixture and spread it evenly. Refrigerate the glasses again for another 30 minutes and pour the remaining mango pulp again till the brim of the glasses. Refrigerate again at least for 30 minutes. Garnish with beautiful cherries. Other suggested items for garnishing are choco shavings, choco chips or nuts. Hope you liked the Mango Custard recipe. Also check more delicious easy to make snacks recipes.